ABSTRACT. The chemical profiles of Desmapsamma anchorata, Hymeniacidon heliophila (Porifera), Bunodosoma caissarum, Renilla muelleri (Cnidaria), Aplysia brasiliana, Eledone massyae, Isognomon bicolor (Mollusca), Echinaster brasiliensis, Echinometra lucunter, Holothuria grisea, Lytechinus variegatus (Echinodermata), and Phallusia nigra (Chordata) were determined. Hydrosoluble protein was the most abundant class of substances for all species, except for the ascidian Phallusia nigra, in which the carbohydrate content was higher. The percentages of hydrosoluble protein (dry weight, dw) varied widely among the invertebrates, ranging from 5.88% (R. muelleri) to 47.6% (Eledone massyae) of the dw .The carbohydrate content fluctuated from 1.3% (R. muelleri) to 18.4% (Aplysia brasiliana) of the dw. For most of the species, lipid was the second most abundant class of substances, varying from 2.8% (R. muelleri) to 25.3% (Echinaster brasiliensis) of the dw. Wide variations were also found for the invertebrates nitrogen content, with the lowest value recorded in the cnidarian R. muelleri (2.02% of the dw) and the highest in the molluscan E. massyae (12.7% of the dw). The phosphorus content of the dw varyed from 0.24% (R. muelleri) to 1.16% (E. massyae). The amino acid composition varied largely among the species, but for most of the species glycine, arginine, glutamic acid, and aspartic acid were the most abundant amino acids, with histidine and tyrosine among the less abundant amino acids. The actual content of total protein in the samples was calculated by the sum of amino acid residues, establishing dw values that fluctuated from 11.1% (R. muelleri) to 66.7% (E. massyae). The proteinaceous nitrogen content was high in all species, with an average value of 97.3% of the total nitrogen. From data of total amino acid residues and total nitrogen, specific nitrogen-to-protein conversion factors were calculated for each species. The nitrogen-to-protein conversion factors ranged from 5.10 to 6.15, with an overall average of 5.45. The use of the specific nitrogen-to-protein conversion factors established here is recommended, since it would yield more accurate determinations of total protein in the species tested in this study. Keywords: nitrogen-to-protein conversion factors, total protein, amino acid composition, lipid, carbohydrate, tropical Atlantic. RESUMEN. Se determinaron los perfiles químicos de Desmapsamma anchorata, Hymeniacidon heliophila (Porifera), Bunodosoma caissarum, Renilla muelleri (Cnidaria), Aplysia brasiliana, Eledone massyae, Isognomon bicolor (Mollusca), Echinaster brasiliensis, Echinometra lucunter, Holothuria grisea, Lytechinus variegatus (Echinodermata), y Phallusia nigra (Chordata). La clase más abundante de sustancias para todas las especies fueron las proteínas hidrosolubles, excepto para la ascidia Phallusia nigra, en la que el contenido de carbohidratos fue mayor. Los porcentajes de proteínas hidrosolubles (peso seco, ps), variaron ampliamente entre los invertebrados, de 5,88% (R. muelleri) a 47,6% (Eledone massyae) del ps. El contenido de carbohidratos fluctuó de 1,3 % (R. muelleri) a 18,4% (Aplysia brasiliana) del ps. Para la mayoría de las especies, los lípidos fueron la segunda clase más abundante de sustancias, que varió de 2,8% (R. muelleri) a 25,3% (Echinaster brasiliensis) del ps. También se encontraron grandes variaciones en el contenido de nitrógeno de los invertebrados, con el valor más bajo registrado en el cnidario R. muelleri (2,02% del ps) y el más alto en el molusco E. massyae (12,7% del ps). El contenido de fósforo varió de 0,24% (R. muelleri) a 1,16% (E. massyae) del ps. La composición de aminoácidos varió ampliamente entre las especies, pero en la mayoría de las especies la glicina, arginina, ácido glutámico y ácido aspártico fueron los aminoácidos más abundantes, siendo histidina y tirosina los menos abundantes. El contenido total de proteína total en las muestras se calculó mediante la suma de residuos de aminoácidos, estableciendo valores de ps que fluctuaron de 11,1% (R. muelleri) a 66,7% (E. massyae). El contenido de nitrógeno proteínico fue alto en todas las especies, con un valor promedio de 97,3% del nitrógeno total. De los datos de los residuos de aminoácidos totales y nitrógeno total, se calcularon los factores específicos de conversión nitrógeno-proteína para cada especie. Los factores de conversión de nitrógeno-proteína variaron de 5,10 a 6,15, con un promedio general de 5,45. Se recomienda el uso de los factores específicos de conversión nitrógeno-proteína establecidos aquí, ya que produciría determinaciones más precisas de la proteína total en las especies sometidas a prueba en este estudio. Palabras clave: factores de conversión de nitrógeno a proteína, proteínas totales, composición de aminoácidos, lípidos, hidratos de carbono, Atlántico tropical. Marine invertebrates involve a huge assemblage of animal lineages of high taxa. They represent the core of the known marine biodiversity, since the number of species of benthic invertebrates is the highest among all organisms in the sea, according to the results gathered by the Census of Marine Life (Costello et al., 2010). Despite decades of research on marine invertebrates, there are still significant gaps in our basic knowledge about these organisms. For example, studies on the chemical composition of marine organisms are still scarce, compared to other traditional fields, such as ecology, biogeography, effects of pollution, and conservation of species (e.g., Barbeitos et al., 2010; O'Dor et al., 2010; McCall & Pennings, 2012), among others. In general, information on the chemical composition of marine invertebrates is restricted to taxa with economic importance, such as some species of crustaceans and molluscs, particularly species that are useful as food or feed (e.g., Karakoltsidis et al., 1995; Orban et al., 2002; Sriket et al., 2007; Nurnadia et al., 2011; Sánchez-Camargo et al., 2011). Invertebrates have also been studied in the context of bioprospection of natural products, a search for bioactive molecules that can be used in pharmaceuticals and in potential biotechnological applications (e.g., Faulkner, 1984; Haygood et al., 1999; Haefner, 2003; Newman & Cragg, 2004; Leal et al., 2012; Yang et al., 2013). Information on the gross chemical composition of marine organisms contributes remarkably to our understanding of the species. Analyses of substances such as proteins, lipids and carbohydrates, as well as total nitrogen and phosphorus, have great importance, since they are major constituents of living matter (Barbarino & Lourenço, 2009; Diniz et al., 2012). Carbohydrates are complex biomolecules that perform structural roles in cells, but they also serve as a fundamental reservoir of chemical energy (Lairson et al. , 2008). Lipids are a diverse set of hydrophobic substances that work as important energy reserves for marine animals, contribute for floating and they are structural components of cell membranes and organelles (Subramaniam et al., 2011). Proteins play extremely important roles in most biological processes of living beings, such as enzymatic catalysis, transport and storage, coordinated motion, mechanical support, immune protection, generation and transmission of nerve impulses, and control of growth and differentiation (Zaia et al., 1998). The properties and functions of a certain type of proteins depend on their particular amino acid sequence (Sumar et al., 1994). Phosphorus is present in organisms predominantly in organic forms as a constituent of phospholipids, nucleic acids, and ATP. Nitrogen is an essential element embedded in fundamental structural and functional macromolecules of organisms: proteins, peptides, free amino acids, nucleotides, nucleic acids, and photosynthetic pigments (Karl et al., 2002). The gross chemical composition of living organisms can be influenced by many factors, such as physiological characteristics, habitat and life cycle, in addition to environmental characteristics (Diniz et al., 2012). The chemical composition of heterotrophic organisms is also influenced by the food that they ingest, age and reproductive traits (Zaboukas et al., 2006; Dubischar et al., 2012). In particular, studies of proteins in marine organisms have broad applications. Such data can provide important information about physiological processes in cells, nutritional value of organisms, and exploitation of resources in biotechnological and commercial activities (Lourenço et al., 2004), among others. Many methods have already been developed over the years for the determination of protein, but in view of the diversity of materials/species and their composition of proteins, there is not a method universally used in a sucessfull form for all kinds of samples and organisms (Zaia et al., 1998). The extraction of the protein content is one of the main problems in protein analysis, since it presents varying degrees of efficiency, depending on the method used and the characteristics of the species studied (Barbarino & Lourenço, 2005). In contrast to protein analysis, total nitrogen (TN) is relatively simple to measure, and it is very accurate (Barbarino & Lourenço, 2009). For virtually all species chemically known, most of the nitrogen content is found in proteins, which means that both total protein and TN tend to vary in a proportional fashion (Huet et al., 1988; Mariotti et al., 2008). This also means that nitrogen-to-protein conversion factors (N-Prot factors) can be calculated to estimate the total protein content of a biological sample from its nitrogen content (Mossé, 1990). The use of N-Prot factors is a practical, cheep and fast way to estimate total protein content of biological samples (Lourenço et al. , 2004). The first and most widly used N-Prot factor is 6.25, which was established by Jones (1931) to estimate the protein content of bovine meat (muscles). However, a nitrogen-to-protein conversion factor is influenced by the composition of amino acids in the proteins and by the presence of non-protein nitrogen in the sample (Lourenço et al., 1998). Thus, specific N-Prot factors must be calculated to determine total protein content of different biological samples (Mariotti et al., 2008). In the last years, N-Prot factors have been calculated for wheat - 5.47 (Fujihara et al., 2008), mushrooms - 4.70 (Mattila et al., 2002), seaweeds - 4.92 (Lourenço et al., 2002), microalgae - 4.44 (González-López et al., 2010), and fishes - 5.71 (Diniz et al., 2013), among others. These studies confirm that the use of the traditional factor of 6.25 is unsuitable for many organisms, and indicate the importance of establishing specific N-Prot factors. The use of N-Prot factors is still uncommon in sea science, possibly because most of the scientific community ignores this useful methodological alternative (Diniz et al., 2012). A wide range of organisms has not been addressed with specific N-Prot factors, especially marine organisms. There is scarce information in this field and studies are needed to provide new data to fill the existing gaps. In the present study, we characterized and compared contents of carbohydrate, lipid, protein, nitrogen, and phosphorus of 12 species of marine invertebrates sampled in tropical coastal areas of Brazil. We also established specific N-Prot factors for each invertebrate species. The calculation of the new N-Prot factors was based on the ratio of the sum of amino acid residues (the amino acids recovered after an acid hydrolysis) to total nitrogen content measured in the samples. For most of the species studied here, our data represent the first gross chemical analysis ever performed in Brazil. In this study 12 species of marine invertebrates distributed in five different phyla were analyzed. The identification of the species was carried with experts' supervision. Cnidaria: Renilla muelleri (Köelliker, 1872-Renillidae) and Bunodosoma caissarum (Correa, 1987-Actiniidae); Echinodermata: Echinaster brasiliensis (Muller & Troschel, 1842-Echinasteridae), Echinometra lucunter (Linnaeus, 1758-Echinometridae), Holothuria grisea (Selenka, 1867-Holothuriidae) and Lytechinus variegatus (Lamarck, 1816-Toxopneustidae); Mollusca: Aplysia brasiliana (Rang, 1828-Aplysiidae), Eledone massyae (Voss, 1964-Octopodidae) and Isognomon bicolor (C.B. Adams, 1845-Isognomonidae); Porifera: Desmapsamma anchorata (Carter, 1882-Desmacididae) and Hymeniacidon heliophila (Parker, 1910-Halichondriidae); and Chordata: Phallusia nigra (Savigny, 1816-Ascidiidae). The animals were selected due to their ecological importance in the region and abundance in the field. B. caissarum, E. lucunter, E. massyae, and L. variegatus were collected in Arraial do Cabo (22°57'S, 42°01"W). D. anchorata, E. brasiliensis, and P. nigra were collected in Angra dos Reis (23°12'S, 44°41'W). A. brasiliana was collected in Armação dos Búzios (22°44'S, 41°52'W). H. grisea, H. heliophila, and I. bicolor were collected in Niterói (22°52'S, 43°06'W). R. muelleri was collected in Rio de Janeiro (22°54'S, 43°12'W). 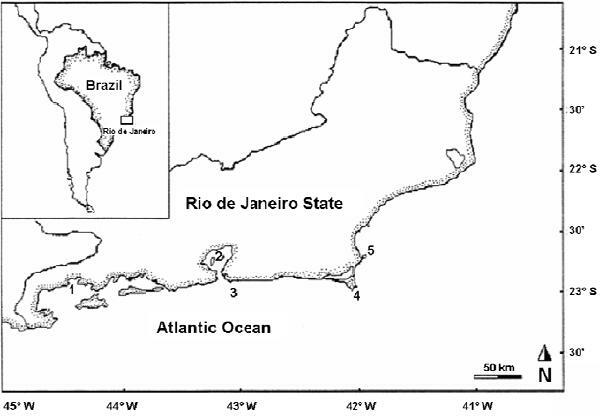 All sampling sites are located in Rio de Janeiro State, southeastern Brazil (Fig. 1). All animals were packed in plastic bags and kept on ice until the arrival in the laboratory, in Niterói, where the samples were washed with distilled water and treated according to the characteristics of each species (e.g., corporal size, part of the body used in the analyses). The samples for chemical analyses were obtained from different individuals, randomly selected. Entire bodies of B. caissarum, D. anchorata, H. grisea, H. heliophila, P. nigra, and R. muelleri were analyzed. Each sample was formed by one unique specimen, except for the samples of the small-sized B. caissarum, which consisted of two specimens per sample. The whole internal contents of L. variegatus, E. brasiliensis, E. lucunter, and I. bicolor were analyzed. For the first two species, samples were formed by individual specimens, whereas samples for E. lucunter and I. bicolor were composed of three and twenty individuals, respectively. The muscles of E. massyae and A. brasiliana were analyzed and each sample formed by one unique specimen. The samples were frozen at -18°C and subsequently freeze-dried in a Terroni Fauvel, model LB1500TT device. The dried material was powdered manually using a mortar and pestle, and it was kept in dessicators containing silica-gel, under vacuum at room temperature, until the chemical analyses were carried out. Four samples were analyzed (n = 4) for carbohydrate, protein, lipid, nitrogen, and phosphorus. Due the high cost of the amino acid analysis using the method employed here, only three replicates were analyzed for each species (n = 3), a widely accepted procedure. The Lowry et al. (1951) method was used to evaluate the hydrosoluble protein in the samples, with bovine serum albumin as a protein standard, following the extraction procedures proposed by Barbarino & Lourenço (2005). Spectrophotometric determinations were done at 750 nm, 35 min after the start of the chemical reaction. Total carbohydrate was extracted with 80% H2SO4, according to Myklestad & Haug (1972). The carbohydrate concentration was determined spectrophotometrically at 485 nm, 30 min after the start of the chemical reaction, using the phenol-sulfuric acid method (Dubois et al., 1956), and glucose as a standard. Total lipid was extracted according to Folch et al. (1957), and determined gravimetrically after solvent (chloroform) evaporation. Total nitrogen and phosphorus were determined in the samples after peroxymonosulphuric acid digestion, using a Hach digestor (Digesdhal®, Hach Co.) (Hach et al., 1987). Samples were digested with concentrated sulfuric acid at 440°C and treated with 30% hydrogen peroxide. Total nitrogen and phosphorus contents in the samples were determined spectrophotometrically after specific chemical reactions. See Lourenço et al. (2005) for analytical details. Total amino acid was determined by high performance liquid chromatography with pre-column derivatization with AccQ.Fluor® reagent (6-aminoquinolyl-N-hydroxysuccinimidyl carbamate), reverse phase column C18AccQ.Tag® Nova-Pak (150x3.9 mm; 4 μm), ternary mobile phase in gradient elution composed by sodium acetate 140 mM + TEA 17 mM pH 5.05 (solvent A), acetonitrile (solvent B) and water (solvent C), flow 1 mL min-1 (Cohen & De Antonis, 1994). A Waters, model Alliance 2695 chromatograph was used, equipped with a fluorescence detector Waters® 2475 (μex. 250 nm, μem. 395 nm). Analytical conditions were suitable to determine all amino acids, except tryptophan, cysteine + cistine and methionine. The percentage of nitrogen in each amino acid was used to calculate nitrogen recovered from total amino acid analysis. Aspartic acid, threonine, serine, glutamic acid, proline, glycine, alanine, valine, isoleucine, leucine, tyrosine, phenylalanine, histidine, lysine, and arginine contents were multiplied by 0.106, 0.118, 0.134, 0.096, 0.123, 0.188, 0.158, 0.120, 0.108, 0.108, 0.078, 0.085, 0.271, 0.193, and 0.322, respectively (Diniz et al., 2011, 2013). N-Prot factors were determined for each species by the ratio of amino acid residues (AA-Res) to total nitrogen (TN) of the sample: N-Prot factor = AA-Res / TN. Thus, for a 100 g (dry weight) sample having 16.21 g of amino acid residues and 3.48 g of TN, an N-Prot factor of 4.66 is calculated. The amino acid residues of the samples were calculated by summing up the amino acid masses retrieved after acid hydrolysis (total amino acids), minus the water mass (18 H2O mol-1 of amino acid) incorporated into each amino acid after the disruption of the peptide bonds (Mossé, 1990). See Shuuluka et al. (2013) for detailed information on the calculation of different types of N-Prot factors. The results were analyzed by one-way analysis of variance (One Way ANOVA) with significance level α = 0.05 (Zar, 1996), followed, where applicable, with a Tukey's multiple comparison test. The raw data were tested for normality and homoscedasticity and no transformation was needed. The percentage of total nitrogen showed wide fluctuations among species, varying in the octocoral R. muelleri from 2.02% of the dry weight (dw), to 12.7% dw in the octopus E. massyae (Table 1). The poriferans showed similar concentrations of N, about 3.6% dw A significant difference was found in N content of the two species of cnidarians analyzed (P < 0.001), with the sea anemone B. caissarum showing a higher concentration of nitrogen (9.71% dw) compared to the octocoral R. muelleri (2.02% dw). The sea urchins E. lucunter and L. variegatus showed similar concentrations of N in their bodies (5.42% dw and 5.09% dw, respectively), whereas the sea cucumber H. grisea had the lowest (3.66% dw) and the starfish E. brasiliensis the highest value of TN among all echinoderms analyzed (P < 0.001). The nitrogen concentration in the ascidian P. nigra (4.70% dw) was an intermediate value compared to the other invertebrate species. The total phosphorus in the tissues varied widely, with the lowest concentration observed in R. muelleri (0.24% dw) and the highest in E. massyae (1.16% dw) (Table 1). The poriferans showed no significant differences in their P contents, with values close to 0.43% d.w. A significant difference in P concentrations was found for the cnidarians (P < 0.001), with higher concentration recorded in the anemone B. caissarum (1.0% dw) in comparison to R. muelleri (0.24% dw). In molluscs, the octopus E. massyae showed the highest concentrations of P (1.16% dw), while I. bicolor and A. brasiliana showed statistically similar lower values (ca. 0.85% dw). The sea cucumber H. grisea had the lowest P concentration among echinoderms (0.54% dw), whereas the sea star E. brasiliensis showed the highest content of phosphorus (0.86% dw) recorded in this study. The P concentration of the ascidian P. nigra was the second lowest (0.33% dw) among all species. Table 1. Gross chemical composition of twelve species of marine invertebrates sampled in tropical sites of Brazil. Values are expressed as percentage of the dry mass and represent the mean of four replicates ± standard deviation (n = 4). Statistical analysis was done within taxonomic groups. Mean values significantly different: * P < 0.05; ** P < 0.01; *** P < 0.001, a > b > c > d > e. Identical superscript letters (a, a; b, b) or absence of letters indicate that mean values are not significantly different. Results for total carbohydrate indicated predominantly low concentrations in the marine invertebrates analyzed. Ten out of 12 species showed values lower than 7.50% dw of carbohydrate, but the mollusc A. brasiliana exhibited 18.4% dw of total carbohydrate (Table ). The amount of carbohydrate recorded in the ascidian P. nigra (17.4% dw) was statistically not different from that observed in A. brasiliana. Among all species, the lowest concentration of carbohydrate was recorded in the octocoral R. muelleri. The poriferans showed slight differences in their carbohydrate contents (P < 0.01), which were close to 5% dw. The octopus E. massyae had the lowest concentration of carbohydrate among the molluscs (1.85% dw), and E. brasiliensis showed the lowest value for carbohydrate (3.70% dw) among the echinoderms. Results for total lipid also indicated a wide variation among species, ranging from 2.80% dw (R. muelleri) to 25.3% dw (E. brasiliensis) (Table 1). Among the molluscs, I. bicolor showed the highest concentration of lipid (13% dw). B. caissarum (with 8.78% dw) and H. heliophila (with 7.95% dw) had the highest lipid concentrations for cnidarians and poriferans respectively. The concentration of lipid recorded in the octopus E. massyae (3.80% dw) was the second lowest among all species. Three echinoderms (E. lucunter, H. grisea, and L. variegatus) exhibited similar concentrations of total lipid, which were significantly lower (P < 0.001) than that showed by the starfish E. brasiliensis. For most of the species, hydrosoluble protein was the most abundant substance, except for the starfish E. brasiliensis and the ascidian P. nigra, which presented more lipid and carbohydrate respectively. Overall species, hydrosoluble protein ranged from 5.88% dw (R. muelleri) to 47.6% dw (E. massyae) (Table 1). The molluscs A. brasiliana and I. bicolor showed similar concentrations of hydrosoluble protein, around 26.5% dw. Significant differences for hydrosoluble protein were observed in the cnidarians (P < 0.001). For the echinoderms, the values found for hydrosoluble protein had small variation among the species (P < 0.05), ranging from 20.0% dw (L. variegatus) to 24.7% dw (E. brasiliensis). The amino acid profiles of the invertebrates are presented in Table 2. Glycine was the most abundant amino acid in six out of twelve species. The highest concentration of glycine (17.6% of total amino acid - TAA) was found in the sponge D. anchorata, while the sea star E. brasiliensis had the lowest concentration (5.40% TAA). For five out of twelve species, arginine was the abundant amino acid, with E. brasiliensis recording the highest (20.6% TAA) concentration among all species. The most abundant amino acid in the sea cucumber H. grisea was glutamic acid (12.8% TAA). Aspartic acid, glutamic acid and and leucine also showed high concentrations in most of the invertebrates. The percentage of histidine was the lowest in all species, and it was not detected in D. anchorata, A. brasiliana, and P. nigra, whereas the highest concentration of histidine (2.14% TAA) was found in H. heliophila and E. lucunter. Percentages of threonine, serine, valine and isoleucine were similar among all species. Table 2. Total amino acid composition of twelve species of marine invertebrates sampled in tropical sites of Brazil. Results are expressed as grams of amino acid measured in 100 g of invertebrate protein and represent the actual recovery of amino acid after acid hydrolysis. Values are the mean of three replicates ± SD (n = 3). n.d. = not detected. The poriferans showed a very similar pattern of amino acids, except for proline (higher values in D. anchorata, 6.27% TAA), and high concentrations of glycine (17.6% TAA and 16.1% TAA). In cnidarians, B. caissarum had a high concentration of arginine (13.3% TAA), while R. muelleri had higher concentrations of glycine (15.2% TAA) and aspartic acid (14.7% TAA). In molluscs, I. bicolor and E. massaye showed elevated levels of arginine (both with 17.9% TAA) and lysine (10.3% TAA and 8.36% TAA respectively) compared to A. brasiliana. However, the sea hare A. brasiliana had a greater concentration of glycine (15.1% TAA), aspartic acid (9.46% TAA), and proline (8.38% TAA) among the molluscs. In echinoderms, a high concentration of arginine (20.6% TAA) was observed in the starfish E. brasiliensis. The sea cucumber H. grisea and the sea urchin L. variegatus had markedly high concentrations of glycine (10.8% TAA and 16.9% TAA, respectively). E. lucunter showed similar concentrations of the most representative amino acids: glutamic acid (11.3% TAA), arginine (11.6% TAA) and glycine (11.9% TAA). The ascidian P. nigra showed a high concentration of arginine (14.9% TAA). The actual total protein content of the samples is showed in Table 3 as total amino acid residues (AA-res). These values are estimated from the sum of the masses of the total amino acids after the acid hydrolysis. The values of total protein were higher than those for hydrosoluble protein for all species analyzed (Tables 1 and 3). Table 3. Calculation of nitrogen-to-protein conversion factors for twelve species of marine invertebrates based on the amino acid residues to total nitrogen ratio. Values are expressed as percentage of the dry matter, except for the nitrogen-to-protein factors (no unit). Results represent the mean of three replicates ± SD (n = 3). The analysis of AA-res displays a large variation among invertebrates, ranging from 11.1% dw (R. muelleri, octocoral) to 66.7% dw (E. massyae, octopus) (Table. ). Low concentrations of total protein were recorded in poriferans, which had total protein around 19% dw. A large variation in total protein was observed with the cnidarians, with the sea anemone B. caissarum (52.6% dw) showing a higher concentration than the octocoral R. muelleri (P < 0.001). The mollusc A. brasiliana and I. bicolor had similar total protein concentrations (42.2% and 46.7% dw, respectively). The same was observed for the two sea urchins analyzed (E. lucunter and L. variegatus, with 29.6% and 27.6% dw of total protein respectively). The invertebrates showed a wide variation in the quantification of nitrogen recoverd from amino acids residues (amino acid-N or AA-N), with values between 1.93% dw (R. muelleri) and 12.7% dw (E. massyae). Similarly to the results for total protein, low concentrations of AA-N were recorded in poriferans and a large variation was observed in cnidarians. The relative percentage of protein-N (PN) was estimated as the ratio of nitrogen recovered from amino acid residues (Table 3) to total nitrogen (Table 1). The relative percentage of PN was high and varied slightly between species of invertebrates. Protein nitrogen was higher than 90% for all species, except for the poriferan D. anchorata (with 89.2% of PN). The octopus E. massyae and the sea urchin L. variegatus exbited more than 99% of total nitrogen incorporated into protein. Through the ratio of AA-res and TN, specific nitrogen-to-protein conversion factors were calculated for each species. The N-Prot factors calculated for the marine invertebrates ranged from 5.10 (D. anchorata) to 6.15 (H. grisea), with an overall average factor of 5.45 (Table 3). It was observed for the molluscs that the A. brasiliana (5.61) had a higher N-Prot factor than E. massyae (5.25) and I. bicolor (5.25). Similar N-Prot factors were calculated for the two cnidarians, but the poriferan H. heliophila (5.72) had a N-Prot factor higher than that of D. anchorata (5.10). Among echinoderms, the sea cucumber H. grisea had a nominal N-Prot factor higher (6.15) than those calculated for the sea urchins (~5.44) and for the starfish (5.21). The N-Prot factor calculated for the ascidian P. nigra (5.27) was the second lowest among all species. The chemical composition of marine organisms can be influenced by a large number of factors, including physiological characteristics, habitat and life cycle, as well as oceanographic and environmental conditions. The chemical composition of primary producers, such as algae and plants, seems to be more directly influenced by the environmental conditions in which they are inserted (e.g., Kamer et al., 2004; Frankovich et al., 2009), in particular by abiotic factors, such as the availability of light and dissolved inorganic nutrients (e.g., nitrate, phosphate). However, the environment does not affect marine animals exactly in the same way. The chemical composition of heterotrophic organisms is more directly influenced by diet, stage of life and reproductive cycle, for instance (Karakoltsidis et al., 1995; Miles & Clark, 2002; Thatje et al., 2004). Studies involving chemical composition of marine animals are found predominantly in the food science field, that mostly express results in wet weight. In order to compare our data with other studies, it was decided to convert the data from the literature to dry weight (dw), from the indication of the amount of moisture in the sample provided in the studies. According to Ogawa & Maia (1999), in muscles of fish humidity is around 80%. Depending on the species/taxonomic group, in marine invertebrates the humidity varies between 65% and 85% (e.g., Mol et al., 2008; Kechaou et al., 2009; Sykes et al., 2009; Zlatanos et al., 2009; Karthikeyan et al., 2011), with some exceptions such as jellyfish, which can reach levels of 95% humidity (Larson, 1986). The expressive differences in chemical composition among species in the present study may be explained, in addition to the characteristics mentioned above, by the great taxonomic diversity of the organisms analyzed. The animals were grouped by their respective taxonomic phyla, but many species that belong to different orders or classes of a same phylum were analyzed. Thus, within the same phylum, part of the variations in chemical profiles can be assumed as a consequence of phylogenetic traits (Barbarino & Lourenço, 2009). It is also important to point out that our results are expressed as percentage of substance to the total mass, thus the occurrence of large amounts of structural inorganic contents contribute to diminish the tissue concentrations of nitrogen and all other substances measured here (phosphorus, protein, carbohydrate, and lipid). Carbonate skeletons in octocorals and siliceous and calcareous spicules in poriferans (Brusca & Brusca, 2003) are examples of inorganic structural components of some marine invertebrates. Ash is also important, in most marine invertebrates it typically comprises 10 to 15% of dry tissue (Clarke, 2008), but ash may achieve concentrations as high as 40% dw in some animals, such as sea cucumbers (Wen et al., 2010; Sicuro et al., 2012). Thus, the presence of abundant inorganic components contributes to the measurement of low percentages of substances (e.g., in whole bodies of poriferans), which intensifies differences of concentration in comparison to species in which only soft parts were analyzed (e.g., mantle of cephalopods). Most of the analyzed animals showed high concentrations of total nitrogen, typically higher than 4% dw. The high concentration of nitrogen may be related to the presence of great amounts of protein, which is in general the most abundant substance in marine animals (Tomanek, 2011). On the other hand, high concentrations of TN are also influenced by the presence of TMAO (trimethylamine N-oxide), a nitrogenous substance widely present in marine animals that is partially responsible for the characteristic smell of seafood (Ogawa & Maia, 1999). In our study, some species showed low concentrations of TN, such as the octocoral R. muelleri and the poriferan H. heliophila. These species contain high concentrations of inorganic materials within their tissues. The octopus E. massyae showed N concentrations higher than those recorded in all other animals, which may be related to the body part examined. For most of the animals, whole bodies were analyzed, which means that muscles, viscera, skeletons, and other parts together generated the results of chemical composition. In the octopus, the largest animal studied here, small pieces of the body were needed to run the analyses and the samples were prepared using the mantle only, which is composed predominantly of muscles (Brusca & Brusca, 2003). Muscles are especially rich in protein, and the use of the mantle certainly contributed to the higher N content recorded in the octopus in comparison to the other invertebrates. In contrast, for the bivalve I. bicolor both mantle and viscera were analyzed. Viscera tend to show lower concentrations of N, since there is less protein and more substances that work as energy reserves, such as carbohydrate and lipid (Mathew et al., 1999; Arafa et al., 2012; Valverde et al., 2013). Taxonomic differences may also contribute to accentuate differences in the concentrations of nitrogen. For instance, the three mollusc species analyzed belong to distinct classes: I. bicolor (Bivalvia), A. brasiliana (Gastropoda), and E. massyae (Cephalopoda). The most intense difference in the concentration of TN was observed in cnidarians. The lower concentration of TN in R. muelleri (Octocorallia) is probably related to the relatively heavier calcareous skeleton of octocorals (Brusca & Brusca, 2003). The analysis of phosphorus in tissues of organisms generates clues about metabolic rate. According to Ogawa & Maia (1999), fast-moving animals such as fish, squid, octopus and shellfish, spend more energy and consequently use more ATP. This means that animals with fast mobility tend to require a higher P supply than animals with narrower or restrict locomotion. This interpretation is in accordance with our data, since the lowest concentrations of P were found in the ascidian P. nigra and in the sea cucumber H. grisea (besides the sponges and the octocoral R. meulleri, which have abundant inorganic components in their bodies), animals that show minor energy expenditures for locomotion. In contrast, higher concentrations of phosphorus were found in invertebrates with fast mobility, such as the cephalopod E. massyae. High concentrations of phosphorus (>0.9% dw) were also found by Diniz et al. (2013) in a study on the gross chemical composition of nine species of marine fish. In addition, our measurements of phosphorus in the sponge D. anchorata, one of the species with lower percentages of P in our study, are similar to the data presented by Hadas et al. (2005) for the sponge Negombata magnifica (0.40% dw), a member of Demospongiae sampled in northern Red Sea. According to Dong et al. (2011), starfish are rich in phospholipids, which can contribute to explain the high concentration of phosphorus (as well as lipid) found in E. brasiliensis, an animal of moderate mobility. In our study, it was remarkable that the three molluscs exhibited high concentrations of phosphorus in their soft tissues. This same trend was reported by Jurkiewicz-Karnkowska (2002), who studied six species of molluscs (three gastropod and three bivalves) from Poland and found concentrations of P varying from 0.63 and 2.68% dw. Shells of molluscs also contain phosphorus (e.g., calcium phosphate), and the phosphorylated protein conchiolin is abundant in their soft tissues, playing a key role in the aggregation of minerals and organic compounds to produce shells (Cariolou & Morse, 1988). Thus, the presence of conchiolin is crucial to raise the tissue concentrations of P in molluscs. In general carbohydrate concentrations in the invertebrates were low, typically lower than 7.5% dw The low concentration of carbohydrate recorded in the octopus E. massyae is probably related to the use of the mantle for the analysis, a tissue enriched in protein (Lee, 1995). On the other hand, the high concentrations of carbohydrate in the sea hare A. brasiliana and in the ascidian P. nigra may indicate that these animals stockpile energy mainly in the form of glycogen, unlike other animals analyzed. The high amounts of carbohydrate in A. brasiliana may be related to the secretion of mucopolysaccharides, a typical characteristic of members of the subclass Opistobranchia (Brusca & Brusca, 2003). However, in ascidians high concentrations of carbohydrate can be explained by the presence of a protective coat, characteristic of tunicates, composed of tunicin, a substance similar to cellulose (EOL, 2013). There are few studies in the literature on the chemical composition of sea squirts, and most of them are related to the bioprospection of bioactive compounds (e.g., Orts et al., 2013). McClintock et al. (1991) analyzed the chemical composition of the various organs of the ascidian Cnemidocarpa verrucosa, an Antarctic species, and found much lower concentrations of carbohydrate in the species (values ranging from 0.5% to 1.3% dw). Such differences in comparison to our data may be related to specific traits and/or differences of the environments where the ascidians were collected. The concentration of carbohydrate recorded in P. nigra is three times higher than that found by Karthikeyan et al. (2011) for the solitary ascidian Microcosmus exasperatus, and twice higher than the maximum value recorded by Ananthan et al. (2012) for 10 ascidians sampled in southern India. The remarkable content of carbohydrate in P. nigra deserves further studies. Among the molluscs, the high concentration of carbohydrate in I. bicolor compared to the octopus E. massyae is probably due to the participation of the gonads, organs that store carbohydrate (Mathew et al., 1999; Arafa et al., 2012). Cephalopods typically exhibit less than 5% dw of carbohydrate (Lee, 1995), which is in accordance with our data for E. massyae. The poriferans analyzed also showed remarkable differences in the concentration of carbohydrate. The lowest concentrations of carbohydrate in D. anchorata (Halichondrida) can be related to the abundance of silica spicules in this species, more than in H. heliophila (Poecilosclerida). According to Brusca & Brusca (2003), members of the order Halichondrida have a heavier skeleton composed of spicules than members of the order Poecilosclerida. Besides the presence of spicules, D. anchorata has a thin dark layer on the surface that aggregates fine sediments, which can contribute to underestimate the amounts of carbohydrate (in dry weight) and other substances analyzed by us. The cnidarians also showed low contents of carbohydrate, which seem to be influenced by the presence of abundant inorganic components in their bodies. Among the echinoderms, the sea cucumbers are the most studied group regarding to their chemical composition, since many species are edible, being particularly consumed in Asian countries (Wen et al., 2010). The concentration of carbohydrate of H. grisea was 30% lower than that reported by Bechtel et al. (2013) for the giant sea cucumber Parastichopus californicus from Alaska (USA). Sea urchins are poor in carbohydrate, but this substance has a significant role in both body coating and fertilization events (Ghazarian et al., 2010). Mol et al. (2008) reported a concentration of 2.8% dw of carbohydrate in the roe of the sea urchin Paracentrotus lividus, which represents a carbohydrate content ~50-60% lower than those we found in the bodies of E. brasiliensis and L. variegatus. A significant part of the carbohydrate content in adult sea urchins is in a layer of connective tissue attached to the shells (Amarowicz et al., 2012). We used the whole internal components of the sea urchins in the chemical analyses, but the connective tissue may have been avoided in other studies, which could contribute to diminish the measured concentration of carbohydrate. Except for two species (P. nigra and A. brasiliana), all invertebrate species analyzed here showed higher concentrations of lipid in comparison to carbohydrate. This relationship indicates that most animal stocks energy as fat, converting the excess of sugar into fat. In the present study we observed a wide variation in lipid concentrations among species. According to Mathew et al. (1999), Zaboukas et al. (2006), and Özogul & Özogul (2007) concentrations of lipid vary more than the carbohydrate and protein in marine animals, as responses to environmental conditions, physiological traits and feeding. For instance, Prato et al. (2010) reported wide seasonal fluctuations in total lipid in the mussel Mytilus galloprovincialis, with variations from 3.5% dw (winter) to 24.7% dw (summer) in samples collected from a commercial mussel culture farm in southern Italy. H. heliophila and B. caissarum showed higher concentrations of lipid than D. anchorata and R. muelleri respectively. High concentrations of lipid in some species may indicate a greater ability to store lipid than the other species in the same phylum. On the other hand, the lower values of lipid recorded for some species of poriferans and cnidarians is probably related to the presence of great amounts of inorganic substances in their bodies (Brusca & Brusca, 2003; Clarke, 2008), a topic previously discussed by us. In comparison to our results, Eno et al. (2008) recorded 14.7% dw of total lipid in the sea anemone Bunodosoma cavernata sampled in Nigeria, a value higher than that we found in B. caissarum. Hadas et al. (2005) recorded percentages of total lipid fluctuating around 10.6% dw in the poriferan Negombata magnifica from southern Israel (Red Sea), which represents twice lipid than we found in the sponge D. anchorata and ~1/4 more lipid than in H. heliophila. Among the molluscs, the octopus E. massyae was the species with the lowest concentration of lipid. According to Rosa et al. (2005) cephalopods stockpile lipid in the digestive tract and have low concentrations of lipid in muscles (concentrations around 5% of the dry weight). Zlatanos et al. (2006) and Ben-Youssef et al. (2008) reported ca. 6.0% (converted to dw) of lipid in the muscles of the octopus Octopus vulgaris from the Mediterranean Sea. Other authors, such as Lee (1995) and Sykes et al. (2009) have already reported that concentrations of lipid in cephalopods are typically lower than 5% dw. The higher concentrations of lipid found for the other species of molluscs (A. brasiliana and I. bicolor) are in accordance with the use of whole bodies in the chemical analyses, since more lipid tend to be found in other tissues than in muscles (Kechaou et al., 2009; Monroig et al., 2013). The sea hare A. brasiliana and the ascidian P. nigra had lower levels of fat than carbohydrate, suggesting that these animals probably stockpile more energy in the form of polysaccharides. This interpretation is supported by the analysis of carbohydrate, since A. brasiliana and P. nigra showed the highest concentrations of carbohydrate among all species tested in this study. In addition, the low concentration of lipid found in P. nigra is similar to that recorded by Karthikeyan et al. (2011) in the solitary ascidian Microcosmus exasperatus from southern India. Among the echinoderms, the high concentration of lipid in the starfish E. brasiliensis was remarkable. In a review on the bioactive substances of starfish, Dong et al. (2011) state that sea stars have a great diversity of classes of lipids, such as sterols and phospholipids, and that some species show these substances in abundance. The presumable abundance of phospholipids in starfish has support in our data, since high concentrations of phosphorus were also recorded in E. brasiliensis (0.86% dw). McClintock et al. (1990) also observed higher concentrations of lipid than carbohydrate in the starfish Ophidiaster alexandri, and Wang et al. (2013) recorded ca. 24.5% dw of lipid in Asterias amurensis collected in Hokkaido, Japan, a result similar to our data for E. brasiliensis. However, other authors found low concentrations of lipid in starfish, such as Luo et al. (2011), who recorded less than 1% dw of lipid in the crown-of-thorns starfish Acanthaster planci. We hypothesize that the high concentration of lipid in the starfish E. brasiliensis may be species-specific, taking into account that lipid contents of different species of starfish vary widely. For the two sea urchins analyzed here, the concentrations of total lipid were slightly lower than the lipid content recorded by Zlatanos et al. (2009) for the Mediterranean sea urchin Paracentrotus lividus (~10% dw). Our results for lipid contents of sea urchins are similar to the values recorded by Mills et al. (2000) in the guts of Echinometra mathaei sampled in French Polynesia. Holothuria grisea showed ca. twice more lipid than the sea cucumber Cucumaria frondosa analized by Zhong et al. (2007). Total lipid of H. grisea was slightly higher than the lipid content (8% dw) recorded by Betchel et al. (2013) in the giant red sea cucumber Parastichopus californicus, and similar to the contents reported by Wen et al. (2010) for Thelenota anax (9.9% dw) and Actinopyga caerulea (10.1% dw), two edible sea cucumbers from China. The analysis of hydrosoluble and total protein in animal tissues resulted in high values, indicating proteins as the most abundant organic compounds in these heterotrophic organisms. In contrast, protein concentrations recorded for seaweeds tend to be lower than the values found for carbohydrate (e.g., Renaud & Luong-Van, 2006; Diniz et al., 2011). The quantification of protein by the method of Lowry et al. (1951) and by the sum of the residues of amino acids (Spackman et al., 1958) showed significant differences for the invertebrates. For all animal species examined, the values of protein obtained through the Lowry method were lower than those recorded by the sum of AA-res. The possible cause of discrepancies in values is related to the difficulty of extracting protein from freeze-dried samples, according to Barbarino & Lourenço (2005). In addition, analysis of total protein also involves a fraction of the protein content that is associated to biological membranes. Membrane-associated proteins are quantified without restrictions through the sum of the residues of amino acids, since the samples are hydrolyzed under acidic conditions and virtually all amino acids become available to be quantified, except tryptophan and fractions of sulfur-containing amino acids (Lourenço et al., 2002). For all species, the values estimated for hydrosoluble protein by the method of Lowry et al. (1951) were typically 25% to 50% lower in comparison to the values of total protein. This trend is in accordance with results reported by Diniz et al. (2012) in a study of 23 species of marine organisms, also including fish, spermatophytes, and seaweeds. The octopus E. massyae presented the highest protein concentration among all species, which is probably related to the characteristics of the muscle fibers of cephalopods (Lee, 1995). According to Rosa et al. (2005) the levels of total and hydrosoluble protein in cephalopods range from 50% to 75% of the dry weight of the muscle. Ogawa & Maia (1999) report a relationship between lipid and protein in fish muscles, so that when there is an accumulation of large amounts of lipid, the protein content decreases proportionately. This interpretation also seems to be valid for the cephalopod E. massyae, a species that exhibited a small content of lipid. The protein concentration reported by Zlatanos et al. (2006) for the common octopus, Octopus vulgaris, was ca. 75% dw. This value is ca. 35% higher than the concentration of hydrosoluble protein estimated by us for E. massyae, and ca. 10% higher than the total protein estimated by the sum of amino acid residues for the same species. However, Zlatanos et al. (2006) estimated the crude protein of O. vulgaris by the use of the traditional N-Prot factor 6.25, which probably overestimated the actual protein content of the octopus (see the discussion on nitrogen-to-protein conversion factors). High concentrations of protein (63-81% dw) were also recorded by Valverde et al. (2013) in different species of molluscs, including mussel, squid, and octopus, using the N-Prot factor 6.25. Studies regarding protein concentration in sea hares are concentrated on the ink composition (e.g., Bezerra et al. , 2004), on the effects of their seaweed diet on growth and physiology (e.g., Barile et al., 2004), and more frequently on neurochemistry aspects of Aplysia, a model organism in neurosciences (e.g., Hansen et al., 2004). Studies on I.bicolor in Brazil are concentrated on ecological aspects of this invasive species (e.g., Ignacio et al., 2010). However, it is possible to compare data on its chemical composition with those of other bivalve species. For instance, the protein content recorded by us in I. bicolor is similar and it is within the range of temporal variation found by Srilatha et al. (2013) for the clam, Meretrix casta, sampled in southern India (30-45% dw). The protein content of I. bicolor is also similar to those reported for edible bivalves, such as Mytilus galloprovincialis (Fuentes et al., 2009) and Crassostrea rhizophorae (Lira et al., 2013), among others. The higher concentration of hydrosoluble protein found in H. heliophila in comparison to D. anchorata can be explained by the greater presence of spongin, a collagen constituent of the organic skeleton, a feature more representative in mass for members of the order Halichondrida than the inorganic skeleton (Brusca & Brusca, 2003). It is remarkable that both species showed the same amount of total protein, estimated from the amino acid residues: 19.4% dw. This means that the protein extraction in H. heliophila was particularly efficient, promoting the full solubility of its protein content. On the other hand, the difference between hydrosoluble and total protein in D. anchorata suggests that ~1/3 of its protein might not be soluble. However, both species showed less protein than the poriferan Negombata magnifica (~47% dw protein) studied by Hadas et al. (2005). The high content of protein in N. magnifica is probably influenced by the fact that Hadas et al. (2005) performed a controlled cultivation in the sea, preventing the accumulation of fouling and sediments, contrasting with our sponges, which were sampled from the natural environment. A few data on proximate composition of cnidarians is available in the literature, for instance, most studies on chemical composition of cnidarians focus on secondary metabolities (e.g., Leal et al., 2012), calcification (e.g., Madin et al., 2012), and chemical interactions with symbionts (e.g., Garrett et al., 2013). Regarding octocorals such as Renilla, studies on bioluminescence are also found (e.g., Loening et al., 2006). Eno et al. (2008) recorded 39.4% dw of protein in the sea anemone Bunodosoma cavernata sampled in southern Nigeria. This value is higher than our data for hydrosoluble protein (29.6% dw), but it is lower than our results for total protein (52.6% dw) in B. caissarum. The low content of protein (and all other substances analyzed by us) in R. muelleri is attributed to its heavy inorganic components its tissues. Our data of hydrosoluble protein were similar for the four echinoderms analyzed, with values around 22% dw. For total protein, the data for echinoderms were more disperse, with a peak recorded in the starfish E. brasiliensis and the lowest value recorded in the sea cucumber H. grisea. These data suggest that E. brasiliensis possesses a relevant fraction of non-soluble protein and, in contrast, that more than 90% of the protein content of H. grisea is probably hydrosoluble (Barbarino & Lourenço, 2005). The protein content of H. grisea was low in comparison with other sea cucumbers, such as Parastichopus californicus (47% dw; Bechtel et al., 2013), Holothuria polii (37% dw; Sicuro et al., 2012), Cucumaria frondosa (45% dw; Zhong et al., 2007), and 10 species analyzed by Wen et al. (2010), all of then with >40% dw protein. H. grisea seems to be one of the poorest known sea cucumbers regarding protein content. Our data for sea urchins show 30-35% less protein than the values recorded by Zlatanos et al. (2009) for the Mediterranean P. lividus. Protein concentrations of whole soft parts of E. lucunter and L. variegatus were relatively low, exhibiting higher percentages of protein when the comparison is done with studies that focused gonads of sea urchins only (e.g., Mol et al., 2008; Arafa et al., 2012). Besides differences among species (we did not find studies performed with the same sea urchins and sea cucumber analyzed bu us), the contrasting data on protein contents may also result from methodological issues. For instance, data on protein presented by Zlatanos et al. (2009) result of the use of the N-Prot factor 6.25, a procedure that tend to overestimate the actual protein content, a topic discussed forward in this paper. On the other hand, the protein content of E. brasiliensis was ~50% higher than that presented by Luo et al. (2011) for the starfish Acanthaster planci. Ananthan et al. (2012) studied 10 species of ascidians from southern India in a seasonal assessment, and found concentrations of hydrosoluble protein fluctuating from 3.8% to 20% dw. Each one of the 10 ascidians showed its own range of variation, but an overall value for protein concentration would be ca. 12% dw, which is similar to the concentration of hydrosoluble protein that we recorded in P. nigra. Karthikeyan et al. (2011) measured 24.7% dw of protein in the solitary ascidian Microcosmus exasperatus, a value similar to our estimate of total protein in P. nigra. The difference between hydrosoluble and total protein recorded by us in P. nigra was one of the greatest among all species tested. This means that the protocol of extraction of hydrosoluble protein might be unsuitable for the ascidian. Barbarino & Lourenço (2005) reported that the extraction of hydrosoluble from some seaweed rich in agar is more difficult, because the abundant carbohydrate seems to trap the protein. In a parallel interpretation, we hypothesize that the protective coat of tunicin could represent a possible constraint to the full extraction of protein of P. nigra, but this topic should be further assessed in new studies. All organisms analyzed had high concentrations of glutamic acid and low concentrations of histidine. The high concentrations of glutamic acid in many organisms occur due to the fact that this amino acid is the precursor of the synthesis of all other amino acids. The amino groups of glutamic acid are allocated through transamination reactions to form other amino acids necessary for protein synthesis and other compounds (Noctor et al., 2002). On the other hand, low concentrations of histidine are widespread among many species (e.g., Galland-Irmouli et al., 1999; Villanueva et al., 2004; Valverde et al., 2013), and may be related to the more complex process of the formation of this essential amino acid in comparison to other non-essential amino acids. This interpretation is supported by many examples of studies in which low concentrations of histidine were found in diverse organisms, including seaweeds (Lourenço et al., 2002), fish (Diniz et al., 2013), leaves (Yeoh & Watson, 1982), and mushrooms (Mattila et al., 2002). High concentrations of glutamic acid and low concentrations of histidine have already been reported for many marine invertebrates, such as sea urchins (Mol et al., 2008), cuttlefish (Nurjanah et al., 2012), paralarvae of octopus (Villanueva et al., 2004), starfish (Luo et al., 2011), coral mucus (Ducklow & Mitchell, 1979), and ascidian (Zlatanos et al., 2009), for instance. Considerable differences were observed in the concentrations of some amino acids as glycine, lysine and arginine in the invertebrates. Some of the invertebrates showed particularly high concentrations of glycine and arginine, a trend previously recorded by other authors (e.g., Luo et al., 2011; Sicuro et al., 2012). The highest concentrations of glycine were recorded in poriferans and echinoderms, with the exception of the starfish E. brasiliensis. High concentrations of glycine were also found in R. muelleri and A. brasiliana. The highest concentrations of arginine were observed in molluscs and in the anemone B. caissarum. Our results for molluscs differ from those found by Srilatha et al. (2013), who reported moderate concentrations of arginine and high concentrations of lysine, glycine, and phenilalanine in the clam Meretix casta from the southeast coast of India. The octopus E. massyae showed similarities in its amino acid composition in comparison to some species of fish analyzed by Diniz et al. (2013), such as the high concentrations of lysine and leucine. However, the data also show that E. massyae is particularly richer in arginine (which comprised almost 18% of the amino acids), glycine and serine, in comparison to fish. Rosa et al. (2005) analyzed the amino acid composition of the giant squid Architeuthis sp. and found glutamic acid as the most abundant amino acid, followed by four amino acids (aspartic acid, leucine, glycine, and arginine) in similar concentrations. The composition described for Architeuthis sp. differs widely from the amino acid composition of E. massyae reported in the present study. In comparison to the amino acid composition of Octopus vulgaris (Zlatanos et al., 2006), E. massyae showed higher concentrations of serine, glycine, isoleucine, leucine, lysine, and arginine, lower concentrations of aspartic acid, glutamic acid, and histidine, and similar concentrations of of threonine, alanine, valine, and tyrosine. As the protein conchiolin in abundant in molluscs, the concentrations of its main amino acids, such as glycine, arginine, valine, and lysine (Bowen & Tang, 1996), presumably influence the total amino acid budget of the samples. According to Zlatanos et al. (2009), glycine was the most representative amino acid in the sea urchin P. lividus, while histidine and tyrosine were amino acids found in smaller concentrations. Present data for the sea urchin L. variegatus agree with Zlatanos et al. (2009), since the species showed the same trends for glycine, histidine, and tyrosine. However, the second species of sea urchin studied by us, E. brasiliensis, showed arginine as the most abundant amino acid, and also glutamic acid, glycine, aspartic acid and lysine as major amino acids. The amino acid composition of E. brasiliensis was similar to that presented by Mol et al. (2008) for P. lividus roe. Wen et al. (2010) found glycine as the dominant amino acid in eight species of edible sea cucumbers obtained in fish markets of Guangzhou, China. Sicuro et al. (2012) also recorded glycine as the most abundant amino acid in two species of Holothuria found in southern Adriatic Sea. Our results indicate that glycine was the second most abundant amino acid in H. grisea, after glutamic acid. The amino acid composition of E. brasiliensis differs from that recorded by Luo et al. (2011) for the crown-of-thorns starfish Acanthaster planci. E. brasiliensis is richer in arginine and leucine in comparison to Acanthaster planci, a species with high concentrations of glycine and alanine. However, both species of starfish show high concentrations of glutamic acid, aspartic acid, and lysine and moderate concentrations of valine and proline. Unlike what was observed for other substances analyzed in this work, the profile of amino acids in poriferans was very similar for the two species studied, with a marked difference observed in the concentration of proline only. However, the small number of poriferan species analyzed does not allow a more incisive conclusion on a similarity in the amino acids profile as a feature common to members of the phylum. Our results for the ascidian P. nigra showed similarity with those recorded by Zlatanos et al. (2009) for Microcosmus sulcatus: both species are rich in arginine, glutamic acid, aspartic acid, and leucine, and have moderate concentrations of phenylalanine, lysine, and valine. In contrast, Jumeri & Kim (2011) reported high concentrations of valine and threonine in the solitary tunicate Styela clava from Gangwon Province, South Korea. S. clava showed high concentrations of aspartic acid and leucine (Jumeri & Kim, 2011), a characteristic also found in P. nigra and M. sulcatus. The traditional factor of 6.25 (Jones, 1931), widely used in many fields of science, is based on the assumption that intracellular nitrogen is almost or fully distributed in proteins and that 16% of the molecular weight of proteins consists of nitrogen (IDF, 2006). The determination of specific N-Prot factors is influenced by the individual contribution of each amino acid. Organisms that possess proteins rich in highly nitrogenous amino acids (e.g., arginine, histidine) tend to give lower conversion factors. In contrast, if the total protein contains high amounts of amino acids with low concentration of nitrogen (e.g., tyrosine, phenylalanine), the corresponding N-Prot factor is higher (Lourenço et al., 2004). In addition, the presence of non-protein nitrogen (NPN) also influences greatly the N-Prot factors, since in general NPN is not distinguished from protein-nitrogen (Diniz et al., 2011). The literature indicates that there are different ways to calculate specific N-Prot factors. Most of the studies established N-Prot factors either by the ratio between AA-res and TN in the sample or analyzing the relative proportion between AAs and the recovery of nitrogen from the amino acids (AA-N). A recent and excellent discussion on this subject can be found in Shuuluka et al. (2013) and Sriperm et al. (2011), as well as in older studies (e.g., Mossé, 1990; Sosulski & Imafidon, 1990; Lourenço et al., 1998). We estimate N-Prot factors by the ratio between AA-res and TN in the sample, because it is more practical and corrects in a simple way the influence of NPN. Different ways to calculate N-Prot factors yield remarkable different values. For instance, Fujihara et al. (2001) determined the factor 6.0 to convert the nitrogen content into total protein of various vegetables (onion, cucumber, tomato, carrot, etc.) common in Japan, considering only the relative proportion between AAs and the recovery of AA-N. However, in the same study Fujihara et al. (2001) proposed an average factor of 4.39, called net conversion factor, to convert the contents of the TN into total protein, calculating the conversion factor by the ratio between AA-res and TN in the sample. Fujihara et al. (2001) determined that the average contribution of NPN in the tested vegetables is 27% of the TN. The high concentration of NPN explains why the conversion factor that uses TN is lower than the N-Prot factors calculated from AA-N. In another study, Fujihara et al. (2008) compared the conversion factors based on TN and AA-N in samples of rice, wheat and other cereals and found that lower N-Prot factors were calculated using TN: 5.26 (wheat), 5.47 (rice) and 5.54 (other cereals), compared to factors calculated using the AA-N (5.75, 5.81 and 5.95, respectively). From these data Fujihara et al. (2008) have proposed an adjustment in the N-Prot factors, recommending the use of N-Prot factors calculated from the ratio between AA-res and TN. Sosulski & Imafidon (1990) and Tacon et al. (2009) compared the conversion factors calculated for animal and plant products and found that higher N-Prot factors were calculated for animals. These observations can be explained mainly by the higher concentration of NPN in photosynthetic organisms compared to animals. The presence of photosynthetic pigments and the accumulation of inorganic nitrogen in the cells increase the relative importance of NPN in plants and algae (Lourenço et al., 1998; Diniz et al., 2011). Yeoh & Wee (1994) indicated that in plant leaves the NPN represents about 24% of the NT. Lourenço et al. (2004) determined the concentration of NPN in 12 species of microalgae in laboratory cultures, with values ranging from 0.8 to 39% of the NT and proposed an average N-Prot factor for all microalgae of 4.78. According to Mattila et al. (2002), NPN represents 23-40% on the TN in mushrooms cultured in Finland, and an average N-Prot factor of 4.70 was established in their study. Diniz et al. (2013) determined a small influence of NPN (an average of only 3.2%) in nine species of marine fish from Brazil and established an overall N-Prot factor of 5.67 for the fishes. The non-protein nitrogen in marine animals is present in the constitution of various substances. The NPN in fish is mainly in the form of TMAO, but amines, guanidines, nucleotides and their degradation products, such as urea and ammonium salts, are also found (Puwastein et al., 1999). Other non-protein nitrogen compounds which may be present in marine animals are glycine betaine, carnitine and homarin (Ogawa & Maia 1999). The presence of these substances, even in small amounts, contributes to a trend of overestimation of the actual protein content of heterotrophic organisms if the N-Prot factor 6.25 is used. The invertebrates showed an overall average N-Prot factor of 5.45. The N-Prot factors observed among species of animals ranged from 5.10 (D. anchorata) to 6.15 (H. grisea). The high N-Prot factors calculated for animals reflect the reduced concentrations of NPN in these organisms, which recorded an average of 6.7% in their tissues. A large amount of protein nitrogen present in animal tissues raises the specific conversion factors to near 6.25, since almost the entire intracellular N is incorporated into protein. Among the invertebrate groups, the average N-Prot factors calculated for the phyla were similar (Table 3). In general, echinoderms showed the highest N-Prot factors (5.56), followed by cnidarians (5.46) poriferans (5.41), and molluscs (5.37). The high concentration of NPN in D. anchorata prompted this species to show a lower N-Prot factor than that calculated for H.heliophila. The echinoderm H. grisea was the only animal to present an N-Prot factor greater than 6.0. It is important to emphasize that this paper proposes the use of specific factors for the species covered and does not propose the use of average factors calculated for the different phyla, in view of the small number of analyzed species by phylum. Thus, to calculate the total protein of species of marine invertebrates that have not been contemplated by their conversion factors specific N-Prot, we recommend using the average conversion factor 5.45, the overall average N-Prot factor derived from all invertebrates analyzed in this study. As shown in this work, the best estimate for determining the protein value is the sum of the residues of amino acids (Spackman et al., 1958), which represents the actual value of protein in the samples (Mossé, 1990). A comparison of the amounts of protein estimated by the use of the factor 6.25 indicated that there are expressive differences with respect to the values obtained by the sum of AA-res. For instance, the calculation of total protein in the ascidian P. nigra using the traditional factor 6.25 would lead the estimate of the protein concentration to 29.4% dw (6.25x4.70% of TN, Table 1), a value higher than the sum of the amino acid residues (24.8% dw, Table 3). The use of the specific N-Prot proposed here (5.27) would lead to an estimate of 24.77% dw (5.27x4.70% of TN). Similar relationships were found for all other species, showing that the specific N-Prot factors calculated in our study provide more accurate estimates of total protein. The present study shows that even for animals showing low concentrations of NPN the use of the N-Prot factor 6.25 overestimates the actual protein concentration. This means that the animals' proteins analyzed here are richer in nitrogen than other materials/species, which in turn result of the presence of high concentrations of nitrogen-rich amino acids, such as arginine. It is recommended that the specific N-Prot factors calculated in this work are used in research involving the species studied here. Concentrations of nitrogen, phosphorus, carbohydrate, protein, and lipid show wide variations among species and in most cases they seem to be species-specific, without clear taxonomic trends. Protein is the most abundant class of substances in virtually all invertebrates, and protein holds an average of 93.3% of the total nitrogen in the animals. Despite remarkable differences in the amino acid composition, glycine, arginine, glutamic acid, and aspartic acid were the most abundant amino acids in most of the species. Specific-nitrogen-to-protein conversion factors ranged from 5.10 to 6.15, with an overall average value of 5.45 for the invertebrates. Authors are indebted to Brazil's National Council for Scientific and Technological Development (CNPq) and Research Support Foundation of Rio de Janeiro State (FAPERJ) for the financial support of this study. GSD thanks Coordination of Improvement of Higher Education Personnel (CAPES) and EB thanks FAPERJ for their fellowships. Authors thank Dr. Renato C. Pereira, Dr. Aguinaldo N. Marques Jr. and Dr. Emmanoel V. Silva Filho (UFF) for the use of laboratory facilities and to Dr. Carlos Renato R. Ventura (UFRJ), Dr. Manuel Haimovici (FURG), Dr. Rosana M. Rocha (UFPR), and Dr. Fabio B. Pitombo (UFF) for the identification of the invertebrates.